Do you favor order and tradition over chaos and modernism? Do you have strong beliefs about what is right and wrong? Do you adhere to societal standards, especially when it comes to the “family” and communities? And, is one of your goals to bring families and communities together? If the answer to one or more of these questions is “YES,” you most likely have a “manager” personality. What is a “manager” personality? Well, according to the Myers-Briggs Personality Indicator, it is ESTJ personality type. 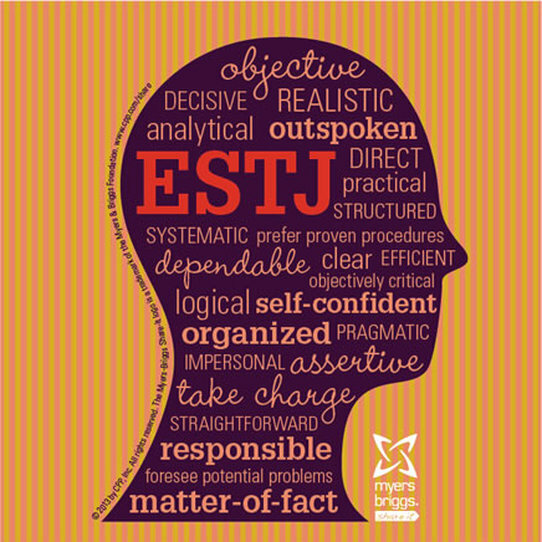 So, what is an ESTJ personality type? Well, it someone who has strong moral and ethical beliefs when it comes to what is considered right and wrong. If you have this personality, you value trustworthiness, self-respect, and commitment to the utmost degree. What do people like best about you? Well, it is your ability to bring people together. What irks you? Well, lazy people, and those who cheat. You truly believe that the best way to build character is to work hard and honor your commitments. What does the abbreviation ESTJ mean? Well, approximately 11% of the general population has an ESTJ personality. And, although this is not as high as some of the other common personality types, there is still a good amount of people with this personality type. Why is the percentage higher than some of the other personality types? Well, in most democratic societies, these types of traits and characteristics are in demand. A little known fact – many American presidents are ESTJs. Why is that? Well, ESTJs like American presidents are strong proponents of following the law and respecting authority. These individuals also believe that trust and loyalty must be earned. They feel that people should lead by example, demonstrating a mixture of honesty and commitment. Do people with ESTJ personalities do well at work? Yes, ESTJs are good workers. Why? Well, because they are hard workers, who follow the rules religiously. They are also consistent at work. They like to maintain order, and do not do well in chaotic or disorganized work environments. ESTJs tend to complete their work on time, and they expect their co-workers to do the same. If you want to lose the respect of this personality type quickly – cut corners or dodge your responsibilities. ESTJs are reliable individuals, who always do things by the book – they are a stickler for following policies and upholding the standards of the company. A weakness – ESTJs tend to be quite stubborn and rigid, if they are presented with weak and/or unrealistic ideas and suggestions. All the same, these individuals are typically open to new ideas and new ways of doing things, especially if it makes the work environment better. However, most ESTJs won’t test out the ideas by themselves. Why? Well, their main goal is to perform their jobs to the best of their abilities, and adhere to any rules and guidelines set by the company. ​As mentioned earlier, ESTJs are loyal and committed workers, but their loyalty, respect, and commitment is contingent on how you treat them, and what they think of you. Moreover, these individuals are not shy about voicing their concerns, beliefs, and opinions, especially when it comes to unacceptable behaviors. Do people with ESTJ personalities have good relationships? Yes and no. What do I mean? Well, ESTJs tend to have a unique way of approaching and managing romantic relationships. What? Well, there is no noticeable change when transitioning from dating to a committed relationship. Those with this personality type value honesty, openness, and candor, which means that they are clear about what they want from a partner and a relationship, what their goals are, and who they are right from the dating/getting to know you stage. There is no mystery when it comes to what an ESTJ wants and needs in a relationship, so potential partners can rest assured that this person means what he or she says, and will not deviate from his or her goals and beliefs. So, as long a potential partner can accept that what an ESTJ says is final, then he or she will experience a long-standing relationship. And, even though, ESTJs are not spontaneous people, they take pleasure in going out with their significant others and having a blast. In other words, they love-love-love social activities and events (think state fairs, amusement parks, night clubs, barbeques, charity events, festivals, concerts, etc.). Socializing is a ESTJs idea of a jolly good time, and even though he or she prefers to spend time with close friends and family, when this person is around, everyone has a great time. Why? Well, because an ESTJ’s excitement and enthusiasm is infectious. Let’s just say ESTJs keep things exciting. When it comes to friends, ESTJs are extremely traditional, placing loyalty and dedication on a pedestal. These individuals tend to seek friendship from those, who share their values and beliefs. When you are friends with an ESTJ personality type, you are bound together through activities, routines, and events that you mutually enjoy. To sum it up, friendships are based on common interests and a steadfast commitment to the relationship. When it comes to parenting, ESTJs teach their children values like: hard-work, respect, honesty, commitment, and tradition. These parents tend to model their parenting styles after those in the 50s – traditional - in which the father is strict, parents are to be respected, and rules are to be followed – no matter what. ESTJ parents expect their offsprings to portray a certain image, and to always, and I mean always, be polite and respectful. These parents will not tolerate disobedience. ESTJ parents tend to believe that assuming responsibility is the pinnacle of life, and they also believe that it should be the goal of all people to do whatever they can to better the lives of their families and communities. What types of jobs are best suited for those with ESTJ personalities? ESTJs tend to do best in jobs that have structure and order. They also do well in jobs that have strict rules. They are loyal, respectful, and responsible individuals, therefore they are likely to stay with one company for as long as possible. Careers that are best suited for ESTJs include: law enforcement, hospital workers, the military, paralegals, policymakers (congressmen), judges, and lawyers. They also make fantastic sales representatives, customer service agents, auditors, business administrators, and financial officers. Do any famous people have an ESTJ personality?